We will be taking one week off for a re-design. New author interview will go live on August 1st! Rick has had a lot of success over the years and I'm proud that he agreed to this interview for Mourning Goats. 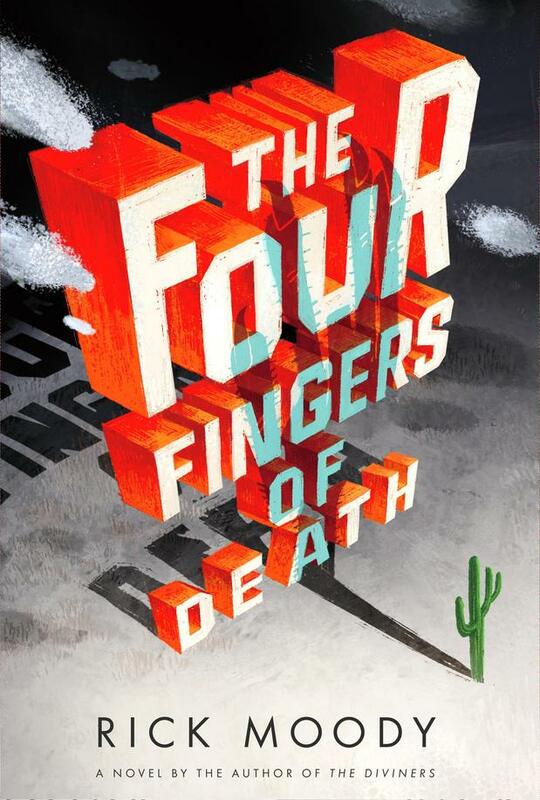 His newest book, The Four Fingers of Death, came out a year ago, this month. Please enjoy this entertaining interview and go pick up his books! The French collage technique known as the faux raccord, in which two apparently disparate and disjunctive elements are yoked together, according to the promptings of the unconscious, if by no other agency, in order to see what energy might result. 2. You’ve been doing a lot of interviews for your newest book, The Four Fingers of Death, what questions are you sick of answering? Actually, I did a lot of interviews last year. I haven’t done any in four or five months, and this is a blessing. This pause. And yet as some time has passed any question seems new today, including this one. I’m more sick of questions about the film called The Ice Storm, and the film called Garden State, which had nothing to do with me, than I am sick of questions about Four Fingers, which in spite of everything still seems like a dark horse of a book, and one, at least for the moment, that I still kind of like. So questions along those lines are gratefully received. 3. Rick Moody, life coach? Can you tell us a little bit about what your thought process behind literature saving lives is? I personally treat literature as though it is deadly serious—even when it’s very funny (and I like comic-flavored stuff a lot)—as though it were more important than other things. Way more important than television, e.g., way more important than Lady Gaga, or even Animal Collective, way more important than whatever indie film is hot at the moment. And I want other people to feel the same way. It’s almost inexplicable to me that other people don’t agree already. “Rick Moody, Life Coach,” which began as a shaggy dog story, for my web site, has lately become deadly serious, and I am somewhat pleased that it has done so. Feel free to ask an advice question there, if it suits you: www.hatredofnaturalism.com. 4. You’ve taught at a few schools, are you teaching now and do you believe that creativity can be taught? I don’t believe that “creativity” can be taught, but I believe that “bad prose” can be corrected with a few handy tricks. I also think that neurosis can be circumnavigated, so as to make literary writing less narcissistic. This is easy to encourage, and when I have done so, when I have encouraged, I often find that there are much improved results among the student body. Whether they are “creative” or not. And who cares about “creative,” really? It’s sort of romanticist crap. Everything is creative. Painting surfboards, designing automobiles, drizzling that maroon gunk around the base of your piece of cheesecake. Yes, this week I am teaching at NYU. 5. In addition to writing fiction, you’re also a composer and musician, do you believe that writing music and writing fiction go hand in hand, or are they two different worlds? I’m not actually a composer, because that would involve staves and clefs and dotted quarter notes, and so on. I am not a very able reader of scores. I am, however, a songwriter, which can be done mostly by ear, at least at my level. I am a lyricist, and sometimes I am a writer of melodies and harmonies too. I am a singer of some minimal ability. And a very bad player of guitar and piano. I don’t, in the end, feel that music and literature are so very different, because they are both auditory phenomena. Language, that is, has a musical aspect, even when it is on a page. You hear the music in your internal register of sounds. And I think, therefore, that playing music makes me a better writer. And: it’s less lonely than writing words down on a page, at least if you do it in a band context. 6. When you started writing, you decided you were going to be a short story writer, what pushed you to start writing novels? There were two reasons: 1) novels were easier to sell, and I wanted to be published, somehow, if only to see what that experience was like, and 2) I felt as though I would never be legitimate if I didn’t try to do it—make a novel—at least once. This was my own neurotic rationale, but there it is. Somehow I got away with publishing a very primitive novel. So I kept going. 7. Who’s your first reader and why? It changes with each project. I don’t feel it’s right to burden a person more than once with this onerous task. Because the person has to be willing to tell me the truth, and I sometimes make it relatively uncomfortable for them. I cause trouble when I don’t like the truth, at least at first. 8. Where do you see language going? Is technology hindering or helping? Technology is both hindering and helping. I find, in general, that digital culture is a force for ill. I don’t think the Kindle or the iPad are so tremendous. I think they dumb things down a bit. (And a reasonable proximation of this effect is seen in the indefensible tendency of the Apple Corporation to capitalize the names of their devices like idiots.) And I think these e-readers are going to change publishing monetarily in a way that makes it less good for writers, makes it harder to stay alive and write, and that is bad for serious fiction, because serious fiction is the first thing to go when publishers are afraid about money. To put it another way: straight-to-Kindle is a great publishing idea if you write vampire books. That said, e-mail, generally speaking, was a development that I welcomed with open arms, because it made it possible for me to ignore my telephone more. Which is a blessing. I delight in typing answers to questions rather than speaking them. I think I do a better job when I am in text mode. Whether text mode will last, however, is another question. When impatient types can use a video interface to the exclusion of the written word, then we are back to an infantile linguistic culture again. 9. You’re a voracious reader, what’s on your night stand now? I’m judging a prize right now so I’m reading a lot of very popular stuff that I missed before. I shouldn’t name names, but it’s all very popular. Also: Samson Agonistes by John Milton. 10. Which is your favorite form to write in, fiction, non-fiction, short stories? Why? No favorite. Each form energizes the others. 11. In an interview from 2009, you said that after your baby was born you felt like you changed a little, and that you would be “more direct, less inclined to waste time,” do you see that coming out in your newer work? I’m wasting more time, actually! And I watch it get wasted with a grim feeling about the whole thing. But it’s true that I’m trying to be a bit more serious than in the last three books. And there’s more about parenting, and about sympathy for parents, in this new manuscript. So far. But who knows. I’m only six months into this project. 12. Compared to the other Mourning Goats interviewees, I noticed that there are a lot of youtube videos of you, is this something you’ve purposely done for marketing, or it just happens that you enjoy being videoed? Actually, being videotaped makes me want to curl up into a ball and die. I had nothing to do with most of those recordings, although I try to accept that this is part of life. Shut up and do your job and quit complaining, etc. I never watch video documentation of myself. Excepting the one where I threw the pie at Dale Peck. I watched that one once. The ones where I speak make me want to die. My voice and my person and the interfacing of the two: horrifying, really. I can’t imagine being the kind of person who thinks this is a good thing, believe me. Maybe Anderson Cooper thinks it is a good thing? No, I bet he never watches the stuff either. 13. You have a music blog on therumpus.net, how did this come about, and why do you do it? Stephen Elliott asked. I probably wouldn’t have done it for anyone else. But I believe in Stephen’s crazy ambition and his hydra-headed empire, and so I thought I’d give it a shot. Initially, I imagined I was going to write a paragraph once a week, without revising, but what happened was that I started to care, and so now the installments are these twenty-page essays that require an enormous amount of work and forethought. So I’m doing it much less frequently than I originally thought. But I am still relatively pleased with the results. There’s a new piece up there right now. About John Lurie. 14. In a lot of interviews you say that location is important for writing. How do you think it affects what you write and how you write? Is it the surroundings, the people, the distractions, or what? I think setting is a character in the work, if that’s not oxymoronic, or excessively paradoxical. At least it’s so in the books I like. Think of Dublin in ULYSSES, or the sea in Conrad or Melville. Or the Alps in THE MAGIC MOUNTAIN. Those books are unthinkable deprived of their settings. I guess now I am interested in settings that are not northeastern suburbs or urban settings. I am tired of books about places I have lived. So I try to go in search of new places, in the hopes that these places will inspire me a bit. Some places are useless. New Jersey is useless to me now. So is Omaha, Nebraska. But the desert! Now that is a place that could inspire you! My sad lot is that now I have to try to get the same feeling out of Springfield, Missouri. For the new book. 15. When you write, you sometimes have multiple projects open at the same time on your computer, it’s impressive that you can focus on each individually, how do you think this affects the way you write? Do you feel like the stories influence each other as you’re writing? Life is lived this way now, with multiple projects always going. Many people, many writers, are like this now, except for people who are more impressively Luddite than I am. I like Luddism. It appeals. But I sort of don’t have as much time for it as I’d like. I have no land line in my writing studio now, and no television, and even no Internet in the actual writing space. But there are other ways that the historical moment creeps in. I’m trying to answer this entire question without using the word “m----t------.” As I am also trying to suggest that the fragmentary qualities of the present are the present in some ways, and that is okay. And, yes, things influence each other a little bit. One set of fragments influences another set. 16. You received your MFA from Columbia University, were you happy with the program, and would you do it again if given the opportunity? 17. Your newest novel, The Four Fingers of Death, is over 700 pages, how hard is it to keep something that long, straight in your head? Is this your longest work (published or not)? It’s the longest. But THE DIVINERS was threatening to be rather long. It’s not so hard to keep long things in your head. You just have to believe in the project, you know? And then whatever emerges from you is part of the project. After the fact you can organize it into something coherent. I believe in absolute liberation in draft one, and absolute dictatorship in draft two. 18. Do you have a set writing schedule or do you write when the urge hits? 19. What advice do you have for the writers out there reading this blog? 20. What’s next for Rick Moody? Q: Have writing do when hits do for out this next moody? A: Exactly. I never know when it’s going to strike, but sometimes when the interstellar strains of radio noise are such as to control the hypnagogic voices, I no longer have a need to kill kill kill, and I am able to see the future and what it beholds. Cephalopods. Arachnids. Flesh-eating bacteria. Medieval religious cults. Cyborgs. Trepanning.